Maya and the Book of Everything is now available through the various Ingram Global Book Group Distribution Partners. This means that Bookstores and libraries can order Maya and the Book of Everything from their normal purchasing channels. Maya and the Book of Everything, is available in local book stores in Maine, and directly from Amazon and Barns and Nobel. And if you are an Amazon Prime member, then shipping is free. That’s what we Mainers call a wicked good deal. 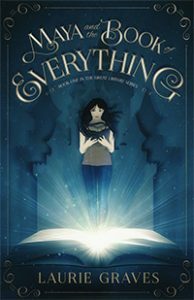 If your local book store does not have Maya and the Book of Everything on their shelves, they can special order it. So please ask. Because of the name of my book, when you do a search for it on Amazon, it is often right next to Isabel Allende’s Maya’s Notebook. Now, how cool is that to be next to one of the giants of literature? Other outlets to follow soon after.